29th November – Open Circuit, Parish Rooms, Ulverston. With Shaun Blezard. 30th November – Blank Canvas, Liverpool. With Mark Hanslip and Johnny Hunter. 13th December – Cafe Bar Marzano’s, Norwich. With Chris Dowding’s brass ensemble ‘Brass Monkeys’. 17th December – The Scope, Brighton. With The Static Memories. 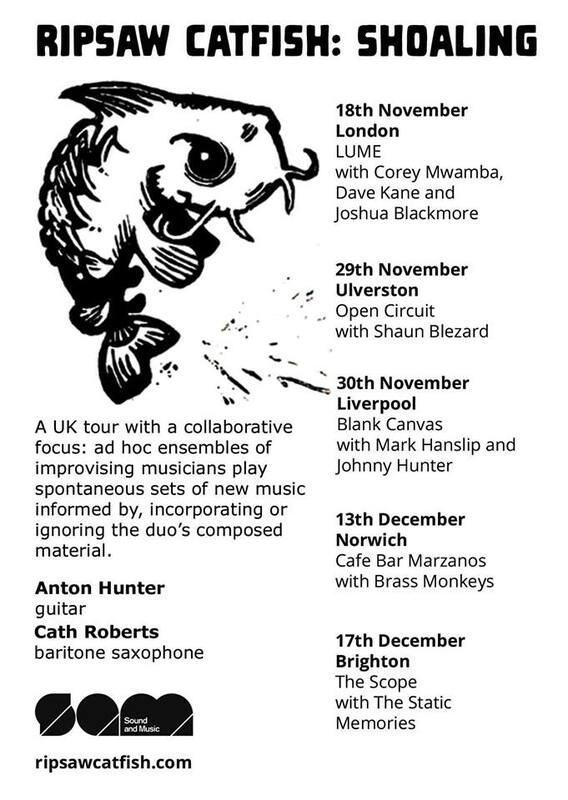 In between Shoaling dates, the eight-saxophone monster Saxoctopus is rearing its head for two gigs. We’re playing at the last ‘LUME Presents’ gig of the year at the Vortex, on Sunday 7th December in a double bill with the excellent Alphabets (Hannah Marshall, Nick Malcolm and Lauren Kinsella). Then on Tuesday 9th December we head to Derby to play at Corey Mwamba’s new series ‘The Family Album’. This will be fun…. With the octopus safely back in its tank (? ), I’ll head directly to Daniel Thompson’s Foley Street concert series for the second meeting of the trio with Corey and Olie. The first one was very enjoyable indeed, so it will be really nice to do it again! This entry was posted in Gigging, LUME, News, Ripsaw Catfish, Saxoctopus on November 24, 2014 by cath. The London Jazz Festival is upon us! 18th, 19th and 20th November: a three night LUME festival special! I’m playing on the 18th (with Ripsaw Catfish) and the 20th (with Quadraceratops) plus referee-ing the Deemer/duck-rabbit double bill on the 19th. More info on the LUME blog post, and there are advance tickets on sale for all three gigs too. 23rd November: Quadraceratops are playing at the BBC Jazz On 3 festival edition of ‘Jazz In The Round’, at the Clore Ballroom, Southbank Centre. We’re kicking off the four-band bill at 2pm. This will be fun! It’s also being recorded for Radio 3, and will be broadcast at 11pm on Monday 8 December. In between all that I’ll be trying to catch everyone else’s amazing gigs. See you out there! NB: The Ripsaw Catfish gig is also the first night of our ‘Shoaling’ tour. We’re heading off around the UK in November and December, collaborating with lots of different improvisers. There’s some more info on the Sound And Music project page, and here’s a handy flyer. This entry was posted in Gigging, LUME, News, Quadraceratops, Ripsaw Catfish on November 18, 2014 by cath. 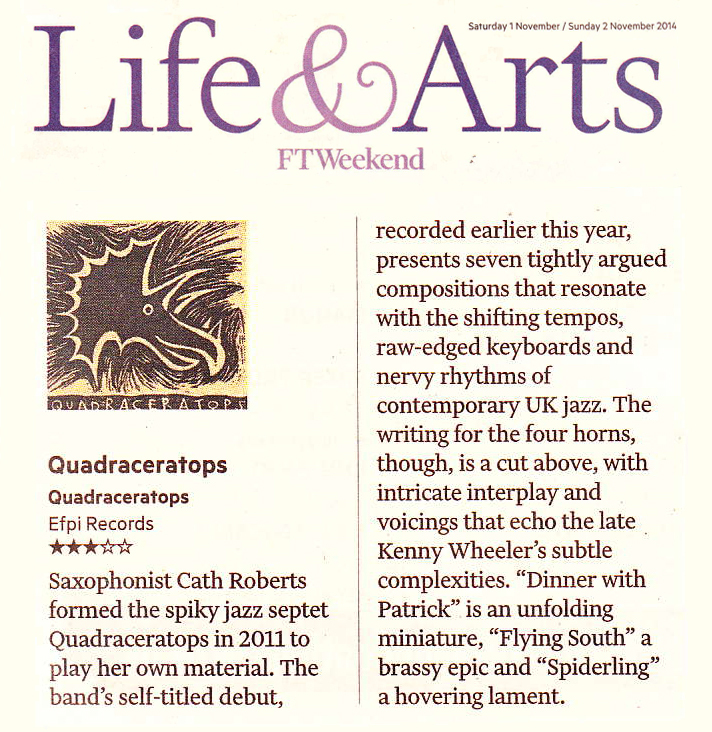 This entry was posted in News, Quadraceratops, Releases, Reviews! on November 8, 2014 by cath.